The EcoMAXX EM-RVEX line of NFPA 69-compliant ATEX explosion tested and certified rotary valves provide effective explosion isolation for industrial filtration, pneumatic conveying, and bulk handling processes. Standard, medium and heavy-duty designs with multiple rotor tip options are available. All EM-RVEX rotary valves are ATEX Certified EN 15089 & NFPA 69 Compliant. Sizes include 10, 14, and 18 in. They are certified to withstand explosive pressures up to 24.66 psi. 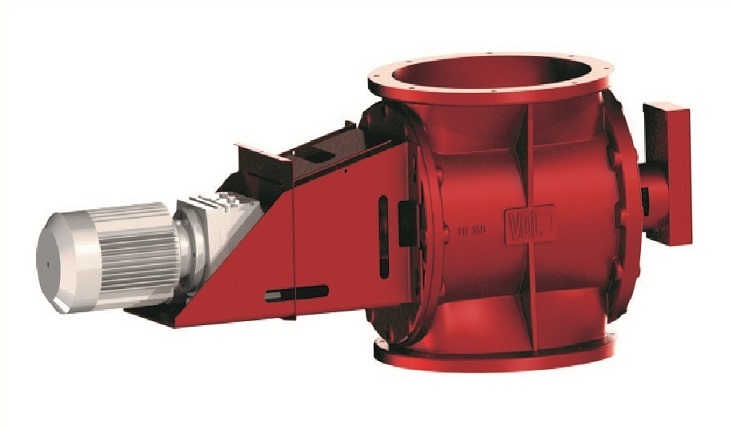 Features include: 8-vane rotor with Vulkollan (polyurethane) flex tips; cast iron housing with flanged inlet/outlet; direct drive motor with flexible coupling and gearbox. Options for variable speed controller, flange gaskets, isolation box, air purge seals, special plating such as chromium or nickel, stainless steel construction and quick disassembly are available.